Make a block. Make a bag. Make the miniest of mini quilts that I can. Just make something. Sew together a few scraps. Make binding (whether I have an actual project for it or just feel like it’ll be a good one to have on hand one day). 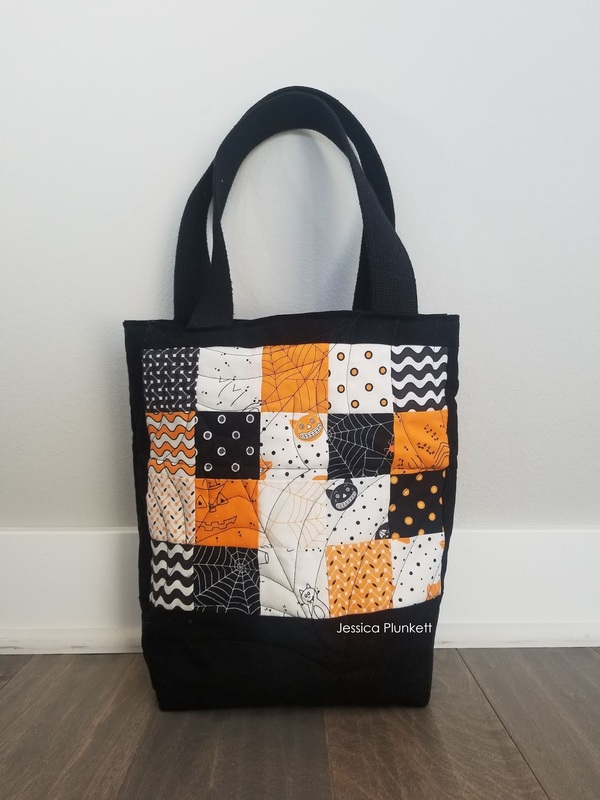 Find a free tutorial for some project what I can put fabric to the machine and be done. The reason to start small is that there’s an intense feeling of satisfaction that can come from finishing something. If my goal was just to sew together a block and I do it, my motivation level rises – which even if it’s just a little, it is so much better than a motivation level of zero. Nothing changes my mood more (for the better) than volunteering my quilting skills. Whether I’m focused on teaching a family member or friend how to sew, I’m relieving myself of fabric I just don’t want/like/need any more or I donate actual blocks or quilt tops or completed quilts, my tone for myself changes. Sometimes my lack of sewjo is because I don’t feel like a sewist or a quilter. I’ve beaten myself up so badly for some reason that I’d rather miss my precious sewing time than sew. But if I can make myself do something for someone else where I know it’s a real benefit to them, I do it and I feel differently about myself and my skills. I know that some organizations look for people to teach older individuals new skills or to teach kids how to sew. I know many schools will take fabric donations (I’ve heard of several schools aligned to Project Linus but I’m sure there many great ways schools can use the fabric!). And there are always great causes looking for block, quilt top and completed quilt donations. The first project is for myself. It’s something I’ve wanted to try. It’s a pattern I love but haven’t taken the time to make. It’s a new bag I want to carry my supplies in. It’s selfish sewing. And it’s okay if my points aren’t sharp or my blocks are askew. It’s for me and it was made by me and it’s perfect the way it is. The second project is for someone else – a family member or a friend. I choose to make something for them and likely that means it will require me to use fabric I wouldn’t normally use, pick up a pattern I wouldn’t pick as my first choice or use a skill that I haven’t used/want to work on. I wrote previously about my Mini Challenge (you can read that post here) where I set out to make four good quilty friends minis just because. One of the best parts of that whole experience was that I was able to challenge myself to work on skill building. I’m a firm believer that if I want to improve my quilting skills, I just have to keep quilting over and over again! This was a great exercise to do that. Were the minis perfect? ABSOLUTELY NOT. I certainly put a lot of love and effort into them and they are nice, but wow, there are imperfections. And my friends LOVED them! Sometimes my sewjo is off because my space is a disaster. Who’s space isn’t, right? Well, the reality for me is there is a threshold I have when it comes to a mess in my sewing room. 20% of it will ALWAYS be in some disarray. The other 80% needs some level of reasoning/cleanliness/etc. I find that when it gets out of balance and I start to clean just even one small space, I find a pattern that was hidden under 923 pieces of fabric or I discover a sketch of a quilt I really wanted to make and forgot about. Or, I discover pieces of fabric that had been hidden and I’m suddenly so inspired by it that I have a new project to immediately begin. I don’t force myself to clean it all (because that would be too overwhelming) but even 10 minutes of “tidying up” can help me uncover lost treasures that bring my sewjo back. Secondly, consider organizing your projects themselves. Find a way to track them – through a quilter’s planner, a notebook, an app – whatever you like. Take notes about the status of each project. Is there something you need to order? Do you need a second opinion to move forward? I find that sometimes just asking for an opinion will squash my sewjo problems and help me see a solution to move forward. Think about how you want to order your projects too. Do you want to order it by closest to completion to haven’t yet started? Do you want to order by most interested in finishing to least interested? Whatever it is, having an idea of how I want to tackle the projects can help me move forward – especially when I see a gigantic UFO list in front of me. So, I know many quilters – myself included – who do quilt as a form of self-care. It’s relaxing. It’s something for me to enjoy. It’s my creative outlet. It’s so many good things for me. But sometimes it’s also overwhelming and frustrating. I’m annoyed at myself. I’m annoyed at my skills. Sometimes I need to step away from the quilting and find another avenue of self-care. I’m also a firm believer in taking care of myself through nutrition and exercise. Now, I completely fail at this aspect sometimes too. I’ve had some health issues in the past year – some are out of my control, but some are absolutely in my control. I’ve neglected some basic principles I believe in and I’m working on changing my routine so that I feel good inside and out about myself, which will translate into more confidence with my quilting.